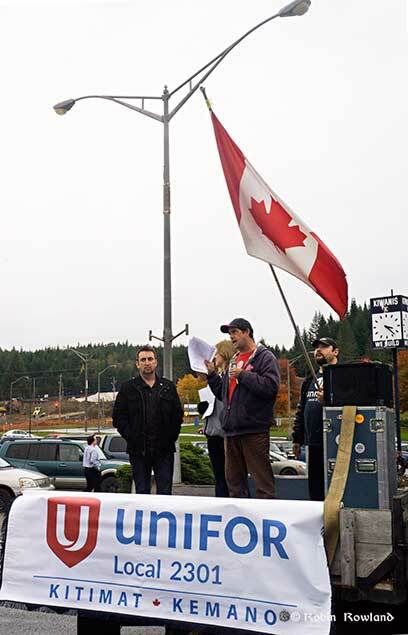 Members of Unifor 2301 rallied in front of the Rio Tinto offices at City Centre Mall in Kitimat, Wednesday, October 7, to protest against what they called “precarious work” and health and safety issues at the Rio Tinto BC Operations aluminum smelter. Sean O’Driscoll, president of the local, concentrated on what he said was an increasingly tense relationship with Rio Tinto over health and safety issues. O’Driscoll told a group of supporters that relations with the company over health and safety have gone down hill since Rio Tinto took over Alcan. 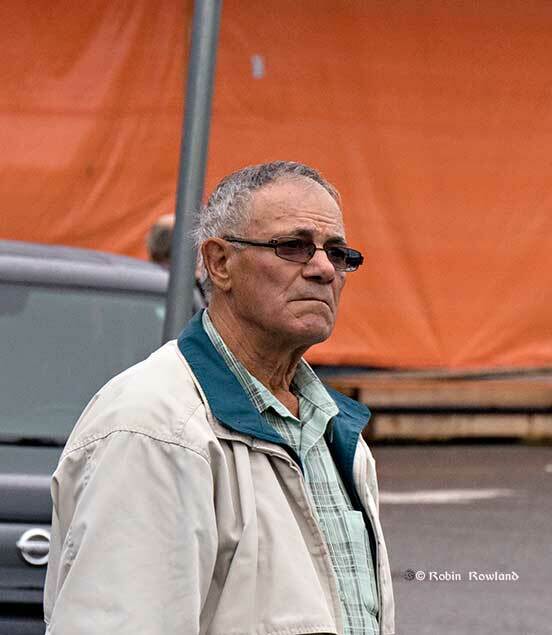 He said the CAW, predecessor to Unifor, had negotiated a strong health and safety agreement with Alcan that Rio Tinto is now trying to weaken down to minimum government imposed standards. O’Driscoll said that the list of grievances between the union and management are growing and that instead of trying to solve the grievances, RIo Tinto has filed a grievance of its own claiming the union has filed too many grievances. The main reason for the rally was a worldwide protest over what the union calls “precarious work,” the use of short term, usually poorly trained workers, what most industries call call “casuals” to save money. The other issue at the protest was increasing contracting out. O’Driscoll also pointed to the controversial issue of increased sulphur dioxide emissions from the upgraded smelter. 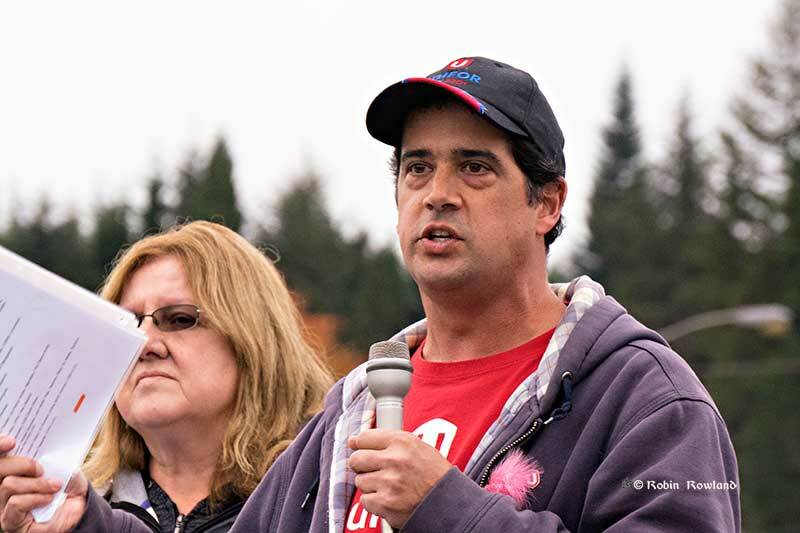 Unifor has joined environmental groups in a successful court challenge to the BC Environmental Assessment Agency’s approval of the emission plan. This story has been updated and corrected. On clarification Capilano mediation is not having a direct affect. 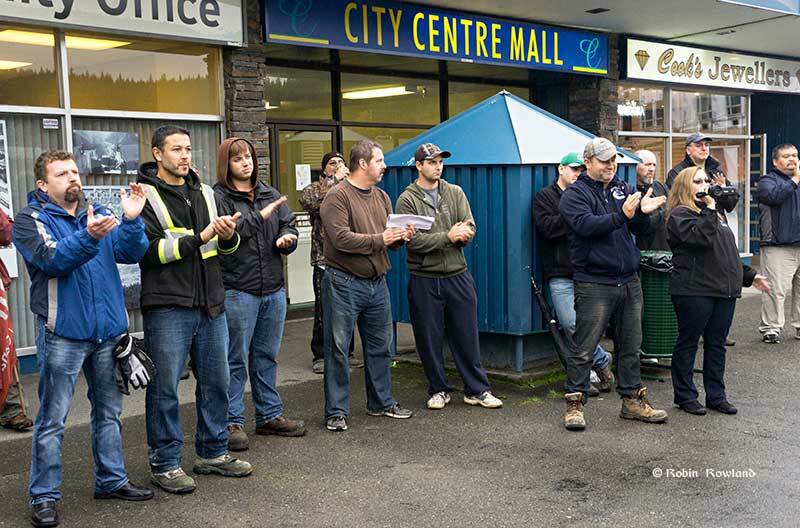 The bitter dispute between the District of Kitimat and its striking municipal employees is going to mediation. The news release from the District of Kitimat says the BC Labour Relations Board has set aside May 1 to 4 for preliminary talks. 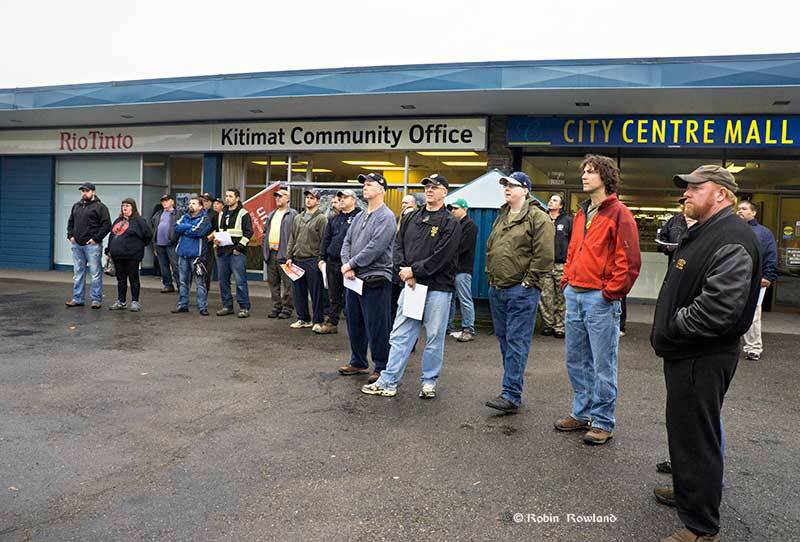 On April 03, 2015 the Union ended negotiations with the District of Kitimat. The District extended another opportunity for the Union to accept the February 26, 2015 Final Offer by April 12, 2015. The Union declined that opportunity. This morning the Union applied to the Labour Relations Board for the services of a Mediator. The District has agreed to participate in mediation. The Mediator appointed today asked the parties to set aside May 01 – 04, 2015 as potential dates for initial meetings. So far, Unifor 2300 has not commented on the announcement. 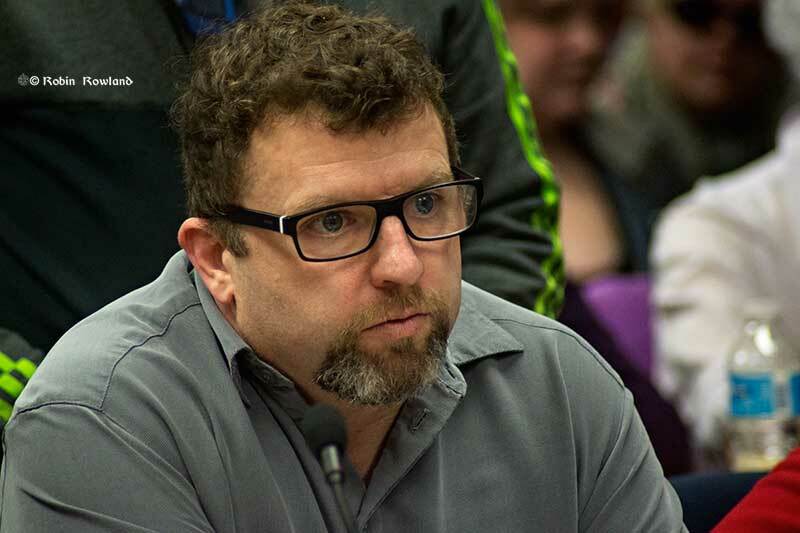 However, Ron Poole said, District Chief Administrative Officer says both sides in the Kitimat dispute are making an effort with the Labour Relations Board to get things started faster, perhaps arranging a weekend meeting before the projected start on May 1. Northwest Coast Energy News has confirmed postings on Facebook that said the District of Kitimat is using the services of a prominent Vancouver based employment firm, Harris and Co. 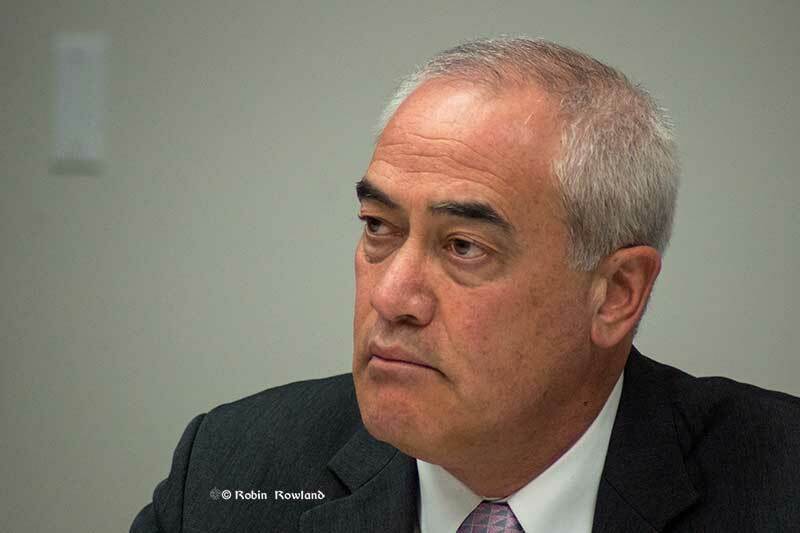 If the two sides had not agreed to mediation, the law firm would have taken over the negotiations, Northwest Coast Energy News has confirmed. 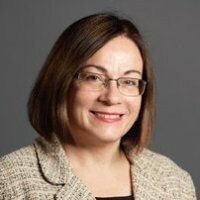 The lawyer representing the District is Adriana Wills, who has more than 30 years experience in employment law including labour relations in municipal government. Wills was hired by Prince George to serve as their chief spokesperson during collective bargaining with the Canadian Union of Public Employees locals 1048 and 399. Wills’ work helped by city to reach an agreement with CUPE after a year of negotiations. 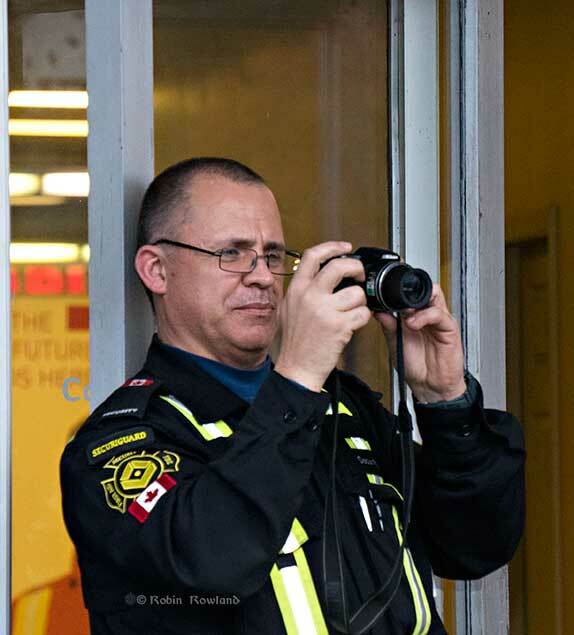 However, the city refused a request under for the Freedom of Information Act from the Prince George Citizen to find out how much Wills was paid. The Prince George budget says it pays Harris and Co. $25,000 a year. According to Wills’ Linked In profile, she speaks fluent Portuguese. Adriana represents a broad range of clients in both the private and public sectors. These include clients in the forest, manufacturing, service, chemical industries, local government, health care and, educational industries. She provides the full scope of legal services to those clients including: strategic planning; risk management; collective bargaining; policy development; training; and, advocacy. Adriana believes in providing practical solutions to the legal challenges faced by clients. Wills has been with Harris and Co. since 1992. She is also an activist on mental health issues. 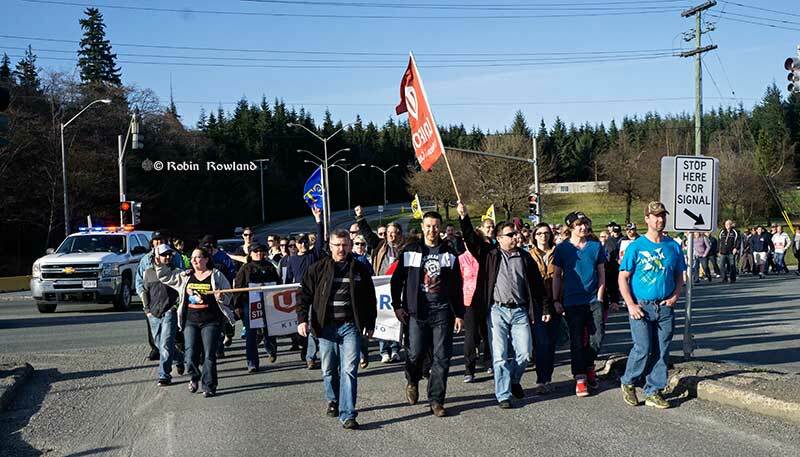 (Earlier Monday by Capilano University to also agreed to go to mediation Faculty at Capilano University have been on strike since last Wednesday, April 8. After both sides in the Capilano dispute agreed to mediation, the Capilano Faculty Association agreed to suspend its strike action. The university will resume operations Tuesday. Exams will begin on Thursday, April 16 and end Friday, April 24. Analysis: The earthquake in Kitimat’s labour relations. It’s time for cooler and expert heads. 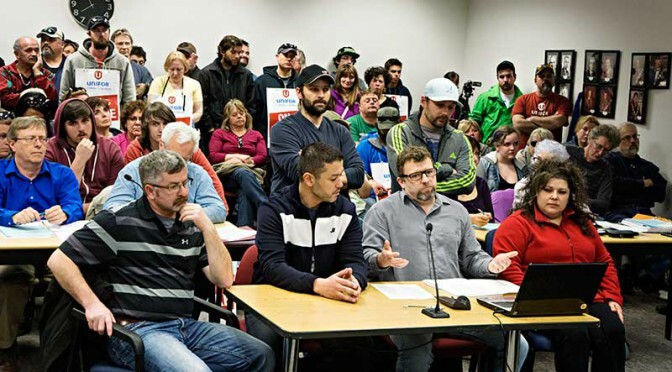 Tuesday night’s District of Kitimat Council meeting, crowded with striking members of Unifor 2300 deteriorated to what became a shouting match between the bargaining committee and Mayor Phil Germuth. If the hostility and anger continue, it is quite likely the strike will last for months. The fallout will last much longer. It is often said that the bitterness following a strike is directly proportional to its length and the repercussions can last for a decade or more. That is not good for the future of Kitimat. There’s talk of mediation, and that’s a good idea, but mediation only works when both sides are willing to sit down and actually listen and talk through the issues. So mediation doesn’t appear to be practical, at least for a few weeks, until both sides are feeling a lot more pain, which is unfortunate. Even if mediation isn’t possible at the moment, it’s time for both sides to stop and bring in some outside experts, experts with cool heads and no personal axes to grind, to guide each side in the negotiations. Do they know what they’re doing? 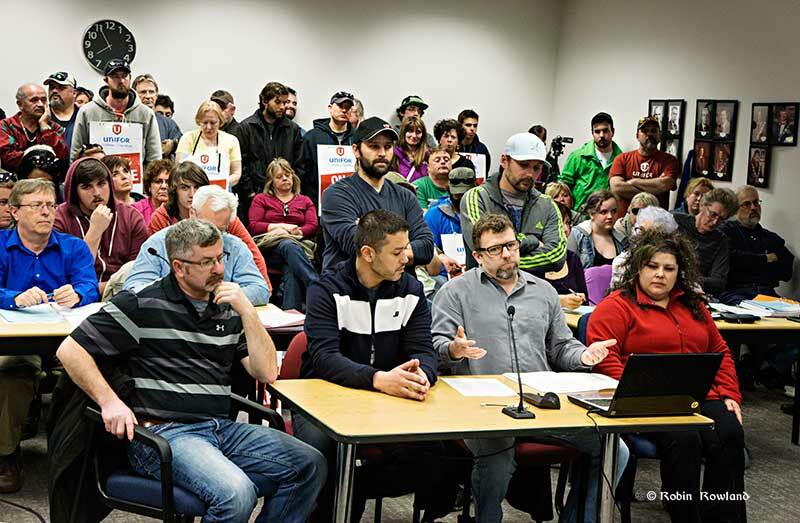 Unifor 2300, apparently not as stunt, but to get their point across, attempted a clause by clause negotiation of certain points at public meeting of council, in front of a partisan crowd. Negotiating in public seldom works, especially if the other side isn’t really listening. There is too much confusion and contradictory statements from mayor, staff and council over the timeline of when they saw the offer from Unifor, even it was just a summary. The trouble with a small town like Kitimat is that this has already become too personal, and both sides are losing perspective. That’s why cooler, outside heads are needed. If the Final Offer is not accepted by the Union by Sunday, April 12, 2015 at 4 p.m. the offer will be withdrawn. The District will then retain the services of an external negotiator who will have the mandate to conclude a Collective Agreement. That negotiator can make decisions on the best way to achieve this goal, including mediation or arbitration. When this piece was written, our idea of bringing in outside experts was to deescalate the volatile situation, not escalating and making it worse. 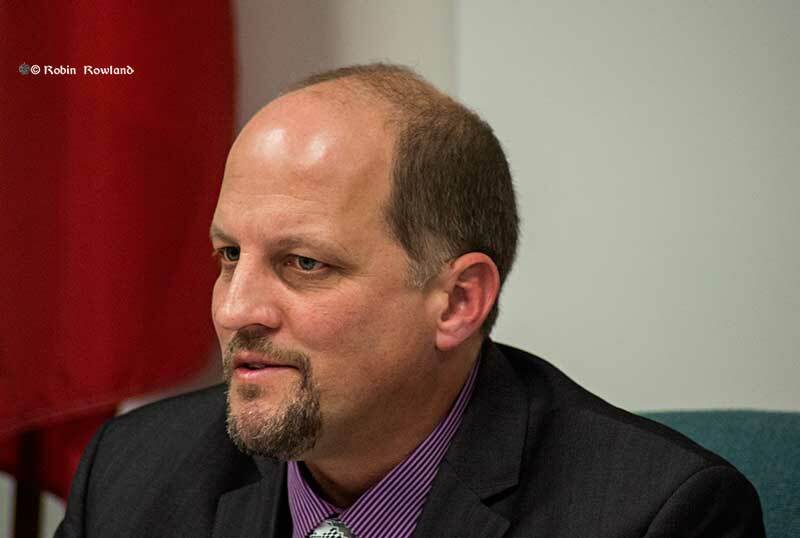 If the District of Kitimat brings in a hard ball “outside negotiator” that will be a long term disaster for the region, even if a settlement is reached (or forced), because as we say above the long term bitterness could last for a decade or more. When we said an outside negotiator respected by both management and labour, we meant just that, an expert in industrial relations that can deescalate the anger. One has to wonder just who is advising mayor and council on this issue? In this analysis calling for Unifor 2300 to also bring in outside experts, we were hoping for deescalation, in a small town where the dispute has become very personal. If the District brings in that outside negotiator, Unifor 2300 will have to call headquarters and bring in the “big guns” and call for national support (which has happened in other labour disputes). Unless there is immediate deescalation, the situation can only get worse. That means Unifor 2300 business agent Martin McIlwrath, Unifor Local 2301 President Rick Belmont who does have some experience, and the rest of the bargaining team should get on the phone to Unifor headquarters today and ask that an experienced negotiations facilitator and an experienced researcher get on a plane for Kitimat immediately and stay here for the duration. (McIlwrath has told reporters he has consulted with other labour leaders by phone. That’s not good enough. This situation needs experts here, on the ground). For Unifor 2300 members, part of your dues goes to union headquarters, so that’s what you’re paying for. A “One Big Union,” which is what Unifor is, has bench strength for situations like this. For Mayor Phil Germuth and CAO Ron Poole, that means immediately hiring an experienced industrial relations consultant, one who is respected by both management and labour, who can also tell the obviously dysfunctional negotiating team what works and what doesn’t. 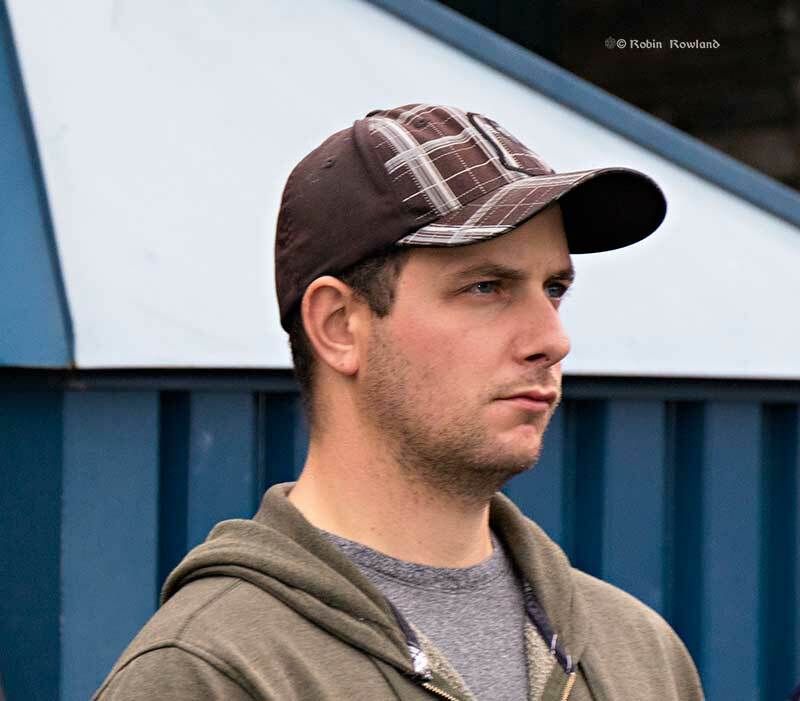 A union researcher and the staff of the labour relations consultant could soon find out what (from their perspective) what is economically feasible given the uncertainty of Kitimat’s future. It was very clear at the council meeting on March 2, when there was a loud picket line at the meeting and now with the secondary picketing of the museum and the public library, that Unifor 2300 has failed to establish a proper picket line protocol. Old time union activists may not like it, but the idea of “never crossing a picket line” is becoming obsolete in the 21st century, especially in situations where there is no longer one single plant gate. These days what usually happens where striking or locked out workers may be picketing office buildings where there are other businesses or where members of other bargaining units may still be working is to establish a picket line protocol. The accepted procedure these days is to establish a waiting time before entering a location. Often this is even agreed between management and the union (where they are still on speaking terms) before a strike or lockout begins. In 1999, the CBC management locked out the then technicians’ union, NABET/CEP. The Canadian Media Guild had settled and was bound by the no strike/lockout clause in the collective agreement. That meant everyone else; CMG, non-union staff and management crossed the NABET/CEP picket lines. The protocol was that everyone waited ten minutes before entering the buildings. At shift change the lines could be quite long and sometimes the wait was as long as a half hour (in Toronto, in January, in the snow). By the time of the 2005 lockout, NABET at CBC had merged with the Canadian Media Guild and everyone was out. Protocols were put in place, management and non-union staff lined up for ten minutes before entering the building. Similar protocols are put in place elsewhere. There have even been cases where truckers entering a multi-company facility wait for ten or fifteen minutes before being waved through. In some of the recent university disputes, students and non-striking staff have had to wait in line before entering campuses. The other problem is the secondary picketing of the museum and library. Neither are parties to the core dispute, although they do receive funding from the District. Museum staff are non-union and library staff are members of CUPE. So the employees at both locations are not part of the dispute. The other problem is that with the library there is collateral damage for the users, especially for students who may want to complete assignments as the school year comes to an end. Students have already been hurt by the teachers’ disputes and this is another burden on their education. Did the Unifor 2300 leadership think about that? In addition, secondary pickets are usually information or leafleting pickets. If Unifor wants to continue to picket the library and museum, it should be clear that line is for information only. If Unifor continues to insist on picketing the two institutions, (which is unfair to those involved) there should be a wait time protocol. Unifor should call CUPE and agree on one. The museum non-union staff should follow whatever CUPE and Unifor agree to. 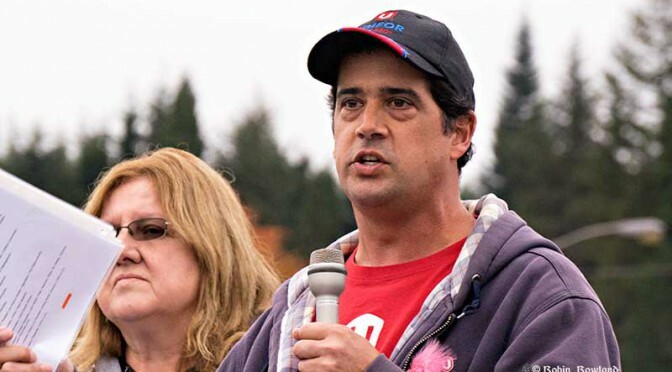 If, in the future, Unifor wants to picket council meetings, which is a democratic and elected body, even if it is party to the dispute, and should be free and open to the public, then a proper waiting time protocol should be either negotiated or, if the union moves unilaterally, they must make it clear what the protocol is. As we found out this week, with the study of the Haida Gwaii earthquake, a tremor happens when locked in strain is suddenly released. So the Kitimat labour relations earthquake was caused when grievances going back 30 years landed on the table this year. Why were the grievances, the strain, allowed to build up for three decades? There is obviously blame on both sides. At Tuesday night’s meeting, there were shouts of bring back Joanne Monaghan. Really? Monaghan was a member of council or mayor for most of those 30 years when the problem was building. Why put all the blame on the current council, which only took office in December? Two members of Council, Larry Walker and Claire Rattée are brand new. Phil Germuth was on council for one term and only became mayor a few months ago. Other council members have been there a lot longer. Both CAO Ron Poole and Deputy Warren Waycheshen are fairly new as well, but they should have been aware of the problems. As far back as early fall, the District’s senior staff told me they were expecting fairly smooth negotiations. My Unifor sources now tell me, at the same time, the union was conducting extensive research on other collective agreements to look for language to improve the poor work environment at the District of Kitimat. The responsibility here lies with the line managers of the District. What did they know and when did they know it? Did they tell Poole, Waycheshen, mayor and council that there were problems escalating? If the line managers knew and didn’t tell, they should be fired. If they didn’t know, then their management of their departments is incompetent, or if they were ignoring the problems, as my union sources allege, then they are part of the problem. If everyone knew and did nothing about it, then that raises questions about management incompetence across the board. Again heads should roll. (And staff managers shouldn’t make snide comments in a public meeting about speakers before council, especially if those managers sit beside the media table. It shows they’re unprofessional and bolsters the union’s case). There is also blame on the union. Labour relations were not an issue during the municipal election. If the problems have been building for 30 years, why wasn’t it an issue? Members of Unifor 2300 can’t shout “Why did I vote for you?” If what the union calls “a poisoned work environment” has existed for years, why did it never come up during the election or the debates? In any situation where a labour dispute is building, the rumblings inside the shop and outside are obvious months in advance. If the line managers and senior managers were either ignoring the problems or were part of the problem, then it was the responsibility of Unifor 2300 to make it an issue in the election. Given the current situation in Kitimat, the current high salaries for senior staff are somewhat justified. Kitimat is not just a small town, it is a small town working with at least four major industrial projects, the Rio Tinto Alcan Kitimat Modernization Project, Shell-led LNG Canada, Chevron-led Kitimat LNG and the Altagas floating LNG project. This involves negotiations and meetings with both government and corporate officials with even much higher pay grades. There is also the ongoing issue of trying to mend the long history of poor relations with the Haisla Nation. The workload for senior staff has been increased exponentially in the past four or five years. I am told by sources that burnout is becoming a factor and that staff, both management and union, involved in industrial development, infrastructure and related issues are taking lots of time in lieu, since most don’t get overtime. Some members of the professional staff are members of the Unifor 2300 bargaining unit. That means workload and burnout for those professional members should also be an issue, one that hasn’t, so far, been raised in union media releases. Here again we see a lack of leadership, both with current management and with the current and previous councils. Any competent manager would have understood that the high salaries for senior staff, however justifiable those salaries may be, would bring questions from the union rank and file and would be a factor in current contract negotiations. (If none of the LNG projects actually proceed, then the salaries for managers and professionals will have to be reassessed). At Monday’s meeting, Phil Germuth said the District had decided to hire a health and safety manager? Why now? Why not years ago? This is a town that lives and breathes on health and safety briefings. Every time, as a member of the media, I visit the RTA Smelter, the Bish Cove site or any other construction or industrial site, I get a health and safety briefing. If you go fishing, whether it’s on a charter or with a friend, there is safety briefing before leaving the dock. This seems to prove the union’s contention that health and safety was a low priority with the District. If the District is going to hire a health and safety manager, why not also hire a Human Resources Manager? The current HR staff at the District are “overworked payroll clerks” (to quote a union source). A qualified HR manager would take that burden off the administrative officers, be aware of proper industrial relations procedures and negotiations practices and be the manager who would implement and enforce anti-harassment procedures. The one group caught in the middle of all this are the summer students. Summer students are hired by many organizations to fill in for vacationing staff and to work on special projects. Summer students should not, as the union is claiming, be used to ensure that casual staff do not get enough hours to qualify for seniority. Reducing the number of summer students, however, is going to have a long term negative effect on the community. Jobs for young people are far too scarce, student loans are becoming such a burden that Millennials who have graduated and those who actually have jobs, can’t afford to buy houses. A lack of summer jobs in Kitimat would be an incentive for young people to leave town or if they are away at college or university, to stay away. Unifor is also not doing the future of the union movement any good by alienating a new generation of potential union members. The summer student program should be restored as much as possible. In a larger community, youth counselling and medically necessary therapeutic pool or gym exercise for seniors and those with disabilities could move to other venues. In Kitimat that is not an option since there are no other locations, so an interim agreement to resume those activities should be high on the agenda—if both sides actually resume talking. Today Royal Dutch Shell, the main company behind the LNG Canada project, took over BG Group which had proposed an LNG project at Prince Rupert. The price of oil is bobbing around the $50 a barrel mark. That means David Black’s refinery project, which depended on high oil prices is “vital signs absent.” The long term prospects for the LNG market are good given the increased demand in Asia. The short term prospects are poor, given that the energy sector’s income from oil has dropped and that means those companies have less money to spend on new projects. The council is being prudent in refusing to lock itself in to long term expenditures based on projects that may never materialize. At the same time, the cost of living in Kitimat, up until recently a mini-Fort McMurray, has skyrocketed. That means the union request for a salary increase should not have been unexpected. It also means that a large number of Kitimat residents, who are paying more for goods and services, many of whom do not have the higher paying project jobs, cannot really afford an increase in property taxes. A compromise on this is essential. That’s why outside experts, with cool heads, research staff and no personal stake in 30 odd years of hostility, should be brought in to bring both sides to an agreement as soon as possible. On the CBC picket line at the Toronto Broadcast Centre, August 28, 2005, As the union photographer I was on the line but with my camera not a sign. I did wear union buttons. Disclosure: I am the current chair of the Board of Directors of the Kitimat Museum and Archives. My term expires at the end of May. I am a retiree member of the Canadian Media Guild/Communications Workers of America from my time at CBC. When I freelance, depending on whether or not the specific job is covered in a collective agreement (some are, some are not) I work under CMG jurisdiction for CBC and the wire services and under Unifor jurisdiction for Global TV and certain newspapers. 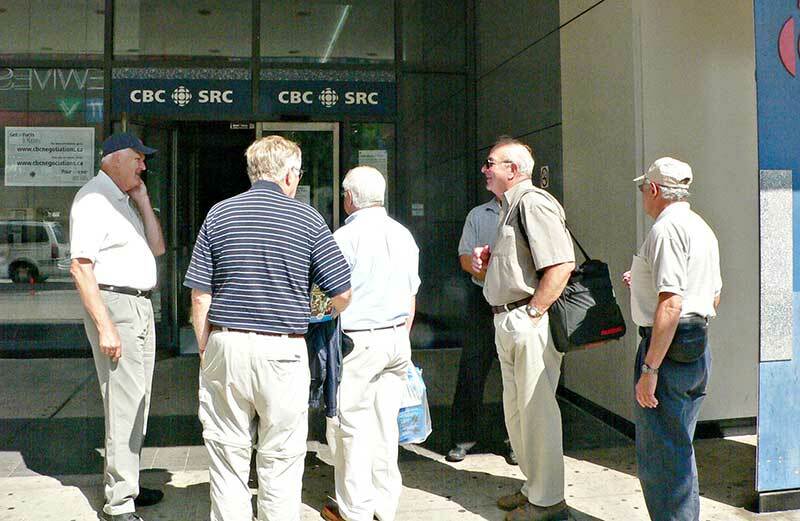 In 2005, CBC management locked out employees from August 15 to October 10. During the period of the lockout, my assigned “picket” duty was as one of the CMG’s official photographers. CORRECTION: This post has been corrected. The events took place on Tuesday, not Monday.